Chess, being for the most part a non-physical sport, rarely requires players to play through injury. But in the Champions Showdown in St. Louis, we saw that and more in an unusual kind of tournament. The Showdown pitted eight players in four arduous deathmatches. The players contested games at different fast time controls—G/5. G/10, G/20, and G/30. 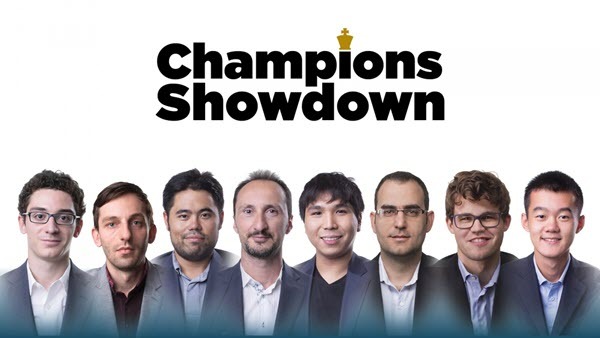 The match between Magnus Carlsen and Ding Liren started later, so I’ll recap that one next week. The other three matches are completed and resulted in match victories for the American Big Three. Hikaru Nakamura has always been a speed specialist, and he had little trouble with Veselin Topalov. Hikaru jumped out to a huge lead, coasted for a bit, and then finished strong to win by a margin of 61.5 points to 30.5 points (a weighted scoring system was used). Any chances Topalov might have had were dashed by frustrating losses in the 5-minute games. He let slip a winning position in the first 5-minute game, drifting into a lost rook endgame. Download HERE the PGN file with Joel's annotations. In the 8th game, Topa had an extra piece in a simple endgame but hung the piece and even managed to lose with even pawns. That 8th game highlights a strange and controversial organization decision to play without any increment or time delay. There has been quite a public response, with a handful of old-school fan taking a “it was good enough for all of us in the old days” kind of position. But I think most people, myself included, are puzzled by the move to not incorporate improvements in the game that technology has brought us. I remember the days of the Friday Night Rapids at the old Manhattan Chess Club, and all the scrambles I had with Jimmy Sherwin, clocks banging, pieces bouncing, often seeming more like basketball. Even the slightest of increment avoids that kind of mess. In some games in St. Louis, players found themselves in a hopeless situation because they were low on time and they had no way to end the game soon enough. It hardly seems like a way to do justice to games between such exalted grandmasters. The truly strange part was the constant pounding on the clock opened up a blister on Wesley’s hand, producing a rather icky blood on the clock situation. The “bloody clock” may not become as legendary of a sports moment as Curt Schilling’s “Bloody Sock” in the World Series, but it sure is something you don’t see every day. So a lot of strange and interesting chess played in St. Louis, though in my opinion, they would improve the event by instituting increment in the games and perhaps shortening or simplifying the schedule and scoring which seemed to get a bit confusing to follow.